In my office sits a chair. On one side is a name – my name. In orange thread it spells out who I was and who I still am. Holly Kane – a scraggly javelin thrower who wasn’t recruited to any colleges. A kid who was gifted the chance to walk on at the University of Tennessee. 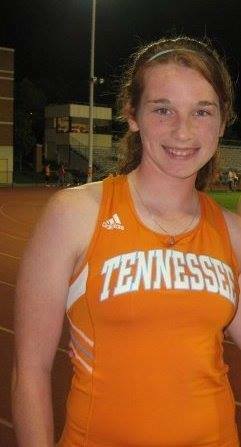 An athlete who finished her career as one of the top ten javelin throwers in UT history. Now, it represents a woman who can face any challenge head on. Who fights for what she believes is right. Who gives back to her community with her skills and her stories. All this and more are embroidered on the front of that fabric. On the back is so much more. On the back of this chair is the Lady Vol logo – a symbol that united every female athlete to grace the UT campus. 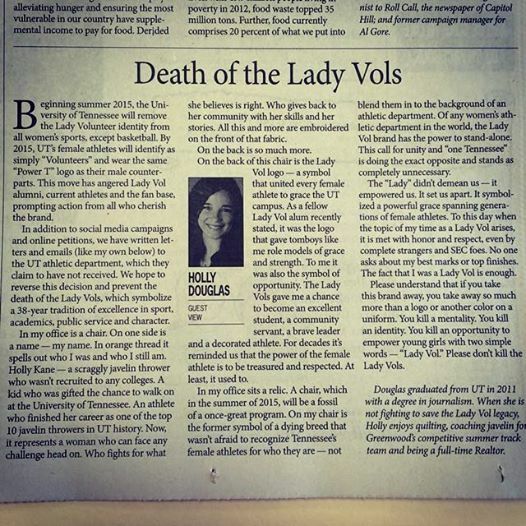 As a fellow Lady Vol Alum recently stated, it was the logo that gave tomboys like me role models of grace and strength. To me it was also the symbol of opportunity. The Lady Vols gave me a chance to become an excellent student, a community servant, a brave leader and a decorated athlete. For decades it’s reminded us that the power of the female athlete is to be treasured and respected. At least, it used to. In my office sits a relic. A chair, which in the summer of 2015, will be a fossil of a once great program. On my chair is the former symbol of a dying breed that wasn’t afraid to recognize Tennessee’s female athletes for who they are – not blend them in to the background of an athletic department. Of any women’s athletic department in the world, the Lady Vol brand has the power to stand-alone. This call for unity and “one Tennessee” is doing the exact opposite and stands as completely unnecessary. The “Lady” didn’t demean us – it empowered us. It set us apart. It symbolized a powerful grace spanning generations of female athletes. To this day when the topic of my time as a Lady Vol arises, it is met with honor and respect, even by complete strangers and SEC foes. No one asks about my best marks or top finishes. The fact that I was a Lady Vol is enough. Please understand that if you take this brand away, you take away so much more than a logo or another color on a uniform. You kill a mentality. You kill an identity. You kill an opportunity to empower young girls with two simple words – “Lady Vol”. Please don’t kill the Lady Vols. Holly’s letter was also published in her local paper, The Index Journal.